What's The Lowest Stamp Price You Can Recall? I’ve never really been aware of stamp prices. I have never had to buy too many of them because I typically just pay my bills online, and don’t really ever send letters. It’s been this way my whole adulthood, and I never really mailed anything as a teen. That’s absolutely amazing. I have cut my mail usage down dramatically but there’s still the odd bill or return form that has to be sent. I think the lowest I remember was around $.20. When I was a kid I went to sleepaway camp and we were required to write letters home. Of course, I wrote more to my friends and would have to give my counselors money to buy more stamps for letters to my parents. I think I would only give them a couple of bucks for a whole book of stamps. I never went away to camp. Hopefully the counselers weren’t bumping up the price 🙂 LOL. I remember 10 cents vaguely, but remember 13 cents very well. I can’t say that I will change my mailing habits as I rarely mail anything unless absolutely necessary. 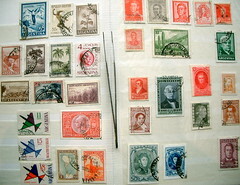 I remember 33 cent stamps. I cannot recall anything cheaper than that and I remember I was bummed when they went up to 34 cents because that meant you had to feed the machine extra pennies for three 🙂 So, I suppose I have “dated” myself now. A price increase would have no effect on my mailing habbits. I keep a book of stamps because I need them every so often, but don’t mail anything that is unnecessary! Except for holidays and such, we generally can go a few months without going through a whole book. i am always confused by stamp prices..
i have a bunch of stamps in a drawer at home, and i have no idea when i bought them.. they don’t have a price or a year on them.. all they say is “first class” or something.. i am quite confident that stamp prices have increase 2 or 3 times since i bought them, but i have no way of knowing for sure. They are probably forever stamps which means that you can use them regardless of price increases. I remember the increase from $.25 to $.29 when I was 9 or 10. I also remember postcards being $.20 which looks like it was around the same time. The price of letters doesn’t really affect my usage of the post office. I pay bills online for the most part (confirmation number! nothing lost in the mail! next-day updating! a carbon-copy for me! ), only mailing in things that absolutely must be mailed – which is getting to be fewer and fewer items. I still send physical greeting cards to some people, though, like my grandparents – I know they like getting “real” mail. Rather than continuing to increase prices, I think the USPS should experiment with some other cost-saving options, like drop daily delivery to four or five days per week instead of six. I for one don’t get enough time-sensitive mail that it would make a difference if I had to wait a few more days to receive it. I agree, cutting a day a week of delivery isn’t going to impact me at all. 10 cents, it was a big deal when they raised the price, I believe it went from 10-12. That’s a 20 percent increase which is pretty substantial no matter how ‘low’ the cost. I found this chart, the price went from 10 cent to 13 cents in 1974. Yeah, Wikipedia has the dates as well. Always interesting to see. My first recollection is like yours Beagle – .20 for first class stamps. Now post card stamps are much more that that! I use stamps primarily for mailing out Holiday Cards, Birthday Cards, etc. I believe Forever stamps would have to say “Forever” on them to truly be those type. If they don’t, you’d need to go to the post office and turn them in to see what they’re worth. I don’t know if the post office does this anymore, but at some point in the past you could turn in your old stamps to buy new ones, like currency. So if I had a bunch of .32 cent stamps, I could take them in and get the equiv of current stamps. I never knew about the ‘turn in’ option. I figured the only option was to buy the additional stamps in the increment of the most recent raise. I do seem to recall that all stamps sold now are ‘Forever’ stamps so anything bought in the last few months and here on out will work as first class stamps without having to buy the incremental stamps.